Mostly for the perfect way they’ve spaced themselves around the bean leaf, like they’ve just learned about sharing in kindergarten. 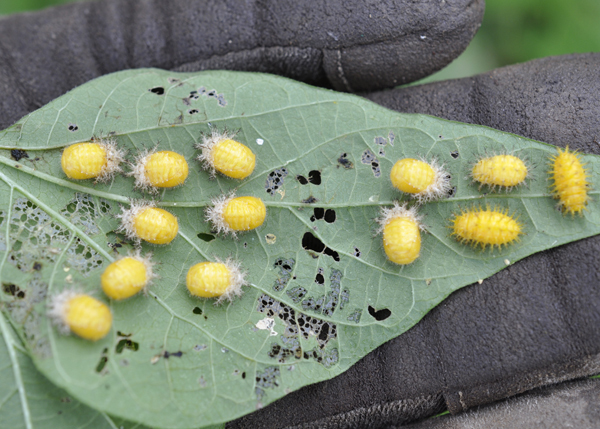 And yes, they are kind of adorable in their way, but I urge you to squish them before they destroy your bean plants. For lots of information about Mexican bean beetles, photos of them at different stages, and control suggestions, please visit Grow It Eat It. Yes, perfectly spaced to perfectly destroy the leaf. You're so right–squish, squish!